Project Soul is hard at work on Soulcalibur 5, and this is a fact. Don't believe it? 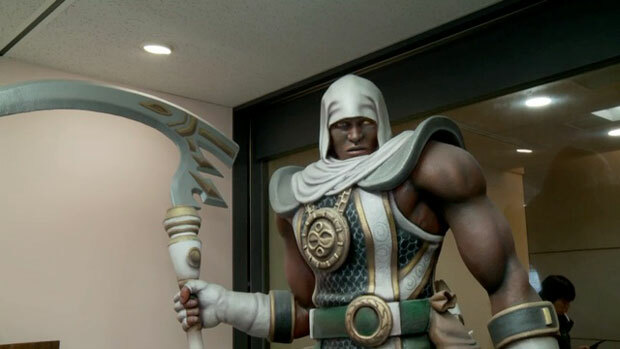 Here's a behind-the-scenes video of the team hard at work on Soulcalibur 5. I think I just did investigative journalism right there. Earlier today, Namco Bandai teased some upcoming characters for the game. Did you guys figure out who they are yet? They could be completely fresh -- I was told at E3 that about half of the game's roster would be brand spanking new. Soulcalibur 5 is out next year for PlayStation 3 and Xbox 360, each of which seems likely to have its own platform-exclusive fighter. While that hasn't been confirmed, Project Soul just looked at each other knowingly and shrugged when I asked them about it at E3. If exclusives were to pan out, who would you like to see fighting on the Xbox 360 and the PS3, respectively?